Sen. Glenn Grothman has his feet held to the fire during public testimony on SB 626. 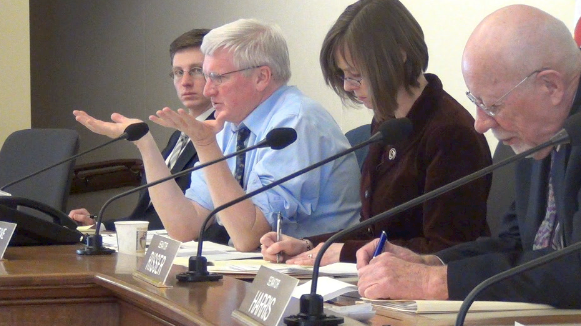 Citizens showed up in droves March 3 to testify against SB 626, an anti-living wage bill introduced by Sen. Glenn Grothman (R-West Bend) and co-sponsored by Rep. Chris Kapenga (R-Delafield). The bill prohibits living wage ordinances in any city, village, town or county which receives state funds. “My job is very dangerous. We’ve got people coming in with drug abuse, alcoholism, mental illness. … They strike out at any given time. We get spit on, we get feces thrown at us. The co-authors of SB 626, Kapenga and Grothman, speak at length about their libertarian ideology while showing their ignorance about the most basic facts of the matter, including the federal minimum wage rate. I am so glad to hear someone calling MKE the economic engine of the state.